It started out innocently, in the kitchen. The more time I spent shopping, cooking and baking, the more I wondered: How do I make it easier, faster, cheaper, prettier, better? 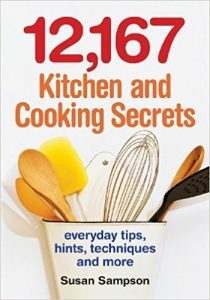 The answers ended up in a book crammed with 12,167 kitchen secrets. Now I just can’t stop. I come across new tips, tricks, techniques, secrets and hacks every day, and collecting them is an addiction. So here we go – 12,167 and counting . . . . In thousands of entries on every aspect of cooking and baking, Susan Sampson provides expert information that is indispensable in any kitchen, including: keeping produce safe from spoilage, protecting equipment from nasty bacteria, shortcuts, embellishments, restaurant tricks, presentation tips, party planning and recipe development. Whether just browsing or desperately trying to solve a vexing emergency, every home cook will treasure this book. Susan Sampson (a.k.a. The Fare Lady) is an award-winning food writer and recipe developer who lives in Toronto.